- Fishing for and eating piranha. It certainly wasn't a profitable venture, more raw meat was expended as a lure than what we caught. Still, it's quite an experience to catch something like that and eat it for lunch! - Swimming in the Amazon right by where pink and grey dolphins were breaching, a very short distance from where we caught piranhas. 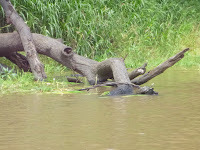 Later in the day and the rest of the week, we repeatedly saw large Caiman (crocodiles) circling that exact swimming spot looking for lunch. A little bit later, a local girl was dangling her feet into the water - her foot and was bitten by a piranha! - There is a concept of high/low water season, as well as the concept of wet/dry season - these two kinds of seasons do not exactly match up. When it is very rainy, it is wet season. When the river level is high from flow from up north, it is high season. During high season, the river level can increase by 2-3 meters, which is a huge amount when you consider what the human and animal kingdoms do to adjust. - This section of the Amazon does a significant amount of cattle farming. 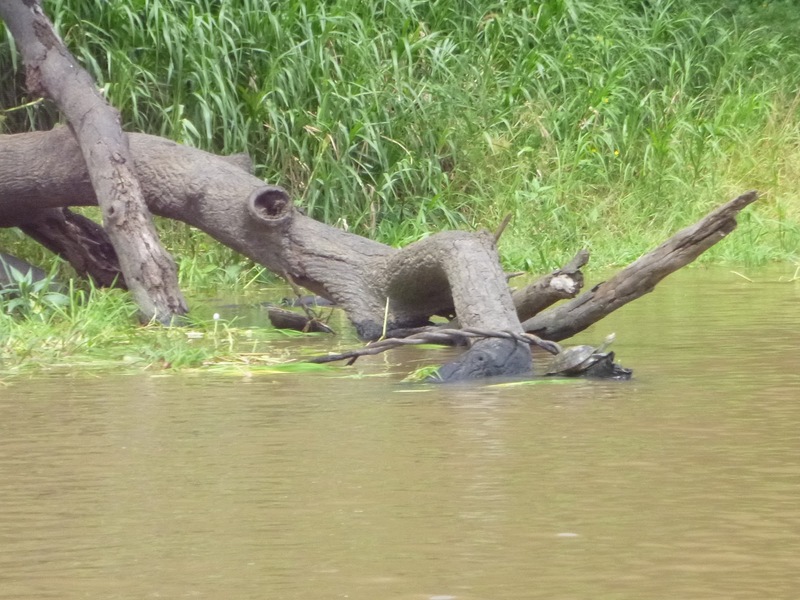 The cows seem to be free to roam through swamps, along riverbanks, and across the river - but watch out for Caiman! - The sky never gets completely dark - and we never saw any stars - even though we're about as far from electric light as anyone could be. Is it because it's so humid that the cloud cover never dissipates? Fabian had to strip down and rescue it! hundreds of thousands of residents! What an adventure! So much to learn about jungle living -- some of which I'm glad I found out AFTER you guys left the jungle!